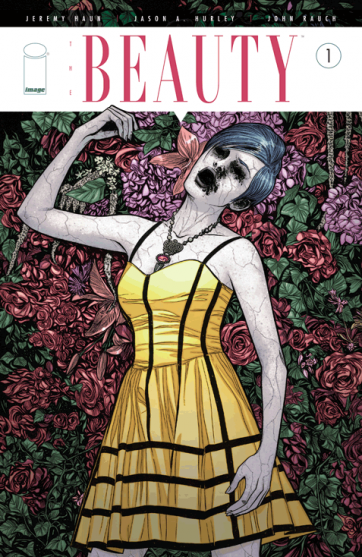 The Fellowship was fortunate enough to obtain a copy of THE BEAUTY #1 from Image Comics. Jeremy Haun and Jason A. Hurley write, Haun draws and John Rauch colors. Vaughn and Foster are the detectives called in on an alleged fire-bombing in the subway. When they get there, it looks more like spontaneous combustion. That the victim is infected with the Beauty, an STD that makes people beautiful, makes it even more suspicious. And there are a lot of people who don’t like Beauties, because they look good and because they have a contagious disease. And now Foster is about to have a much bigger stake in this investigation. This is a pretty cool cop story, but definitely not a simple one. The disease and how people react to it are an interesting reflection on us as a society, to say the least. And the ways that both Vaughn and Foster are affected by it make for some great emotional investment. The art really does a nice job of emphasizing the people, especially with the distinctions that the disease bring out. I like the implications of the idea that a story about beauty can have so many layers to it (“skin deep” my eye). It’s really smart and really well drawn, and you should get on board early. THE BEAUTY #1 is available now at your FLCS or at imagecomics.com.